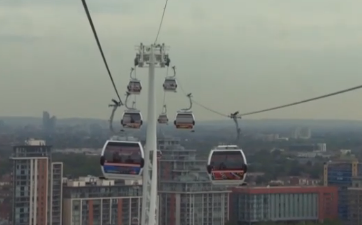 Britain's first “urban cable car” opened in London yesterday just in time for the Olympics. The 'Emirates Air Line' transports passengers across the Thames between North Greenwich and Royal Docks. Passengers enjoy views taking in the City, Canary Wharf, Greenwich, the Thames Barrier and the Olympic Park. The system has a cable span of 1,100 metres across three helix towers, with 34 cars each holding up to 10 people, travelling at a height of 90 metres. Up to 2,500 people an hour can be carried in each direction. Passengers can touch in at the gates with their Oyster cards for a single fare of £3.20 or £1.60 for children. A non-stop return costs £6.40 on Oyster. There is also a “frequent flyer” pass allowing 10 single journeys for £16. On the south bank, the Air Line is about a three minute walk from North Greenwich Tube station. Cable cars arrive at intervals of less than 30 seconds and passengers climb in as it moves. About 30 protesters from the union Unite gathered outside the cable car station at North Greenwich today calling for a £500 Olympic bonus for bus drivers.